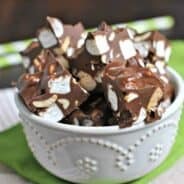 Copycat Salted Nut Roll Candy Bar Recipe is a candy store classic. You can make it at home, and give all your favorite people a homemade gift this year! These homemade candies were a true labor of love. After several unsuccessful attempts, I finally created the result I was hoping for: a soft center wrapped in chewy caramel and salty peanuts! There are a couple of candies that if put in front of me, I could never resist. Pay Day candy bars, Salted Nut Rolls, and Bullseyes (caramel creams). Are you familiar with any of these? 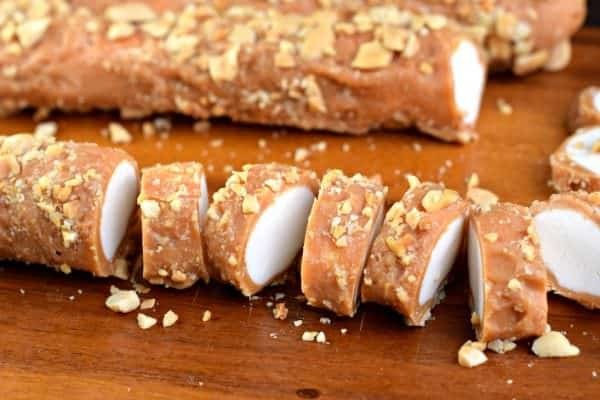 Today’s Salted Nut Roll recipe is a cross between those classic Caramel Creams and a salty Pay Day bar. If caramel is your thing, this is definitely the homemade candy for you, and it would also make a really great homemade Christmas gift. Invest in a silpat silicone baking mat for kneading the marshmallow mixture. It will be like kneading dough, you want it nice and smooth. Divide the “dough” ball into 6 equal portions. 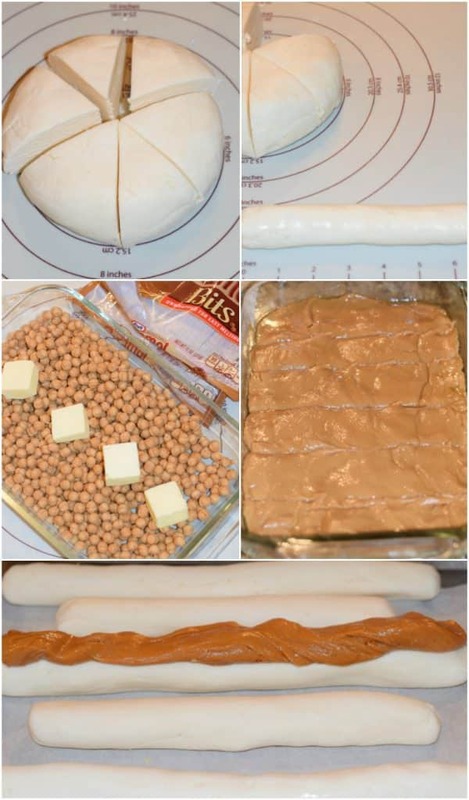 Roll each portion into a 7-8 inch log (about 1-inch thick around). Wrap each log in parchment paper and freeze for 2 hours, until firm. You can even freeze overnight if you’d like. Once you melt your caramel mixture, it will be very thick, and the butter will separate from the caramel. That’s OKAY. Using your hands, once the caramel has cooled slightly, press the caramel into the dish and then use a knife to make 6 equal slices. 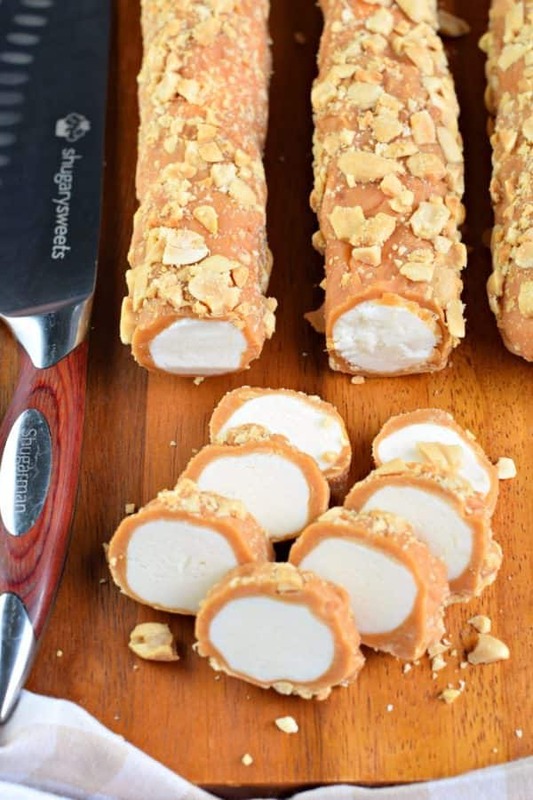 To cover the marshmallow centers in caramel, unwrap the frozen log and using your hands, literally spread the caramel until it covers the center completely. It will feel like you’re working with playdoh. Once the entire log is covered, press the chopped peanuts into the caramel. Re-wrap in parchment paper and refrigerate. Repeat for each log. When ready to enjoy, slice the logs into 1-inch pieces and enjoy! Salted Nut Roll is a candy store classic. 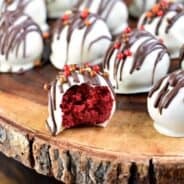 You can make it at home, and give all your favorite people a homemade Christmas gift this year! Melt the butter and marshmallow cream in the microwave, about 30-60seconds, until butter is fully melted. In a large mixing bowl, combine melted butter and marshmallow to the powdered sugar and vanilla. Cream together until just blended. Drop onto a silpat (or large piece of parchment paper). Use your hands to knead the “dough” into a large ball. Divide the ball into 6 equal portions. You’ll then want to use your hands to roll each portion into a 7-8-inch log (the key is to keep it 1-inch thick around). Wrap each log in parchment paper and freeze two hours until firm. Melt caramel bits and butter in an 11x7-inch baking dish in the microwave, about 1 1/2 minutes, until smooth. The mixture will be thick, and the butter will separate from the caramel. That’s OKAY. 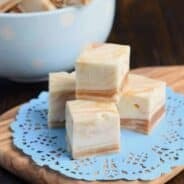 Allow caramel to cool slightly, then using your hands, combine the butter into the caramel and press the mixture into the bottom of the baking dish. Score it into 6 equal portions. 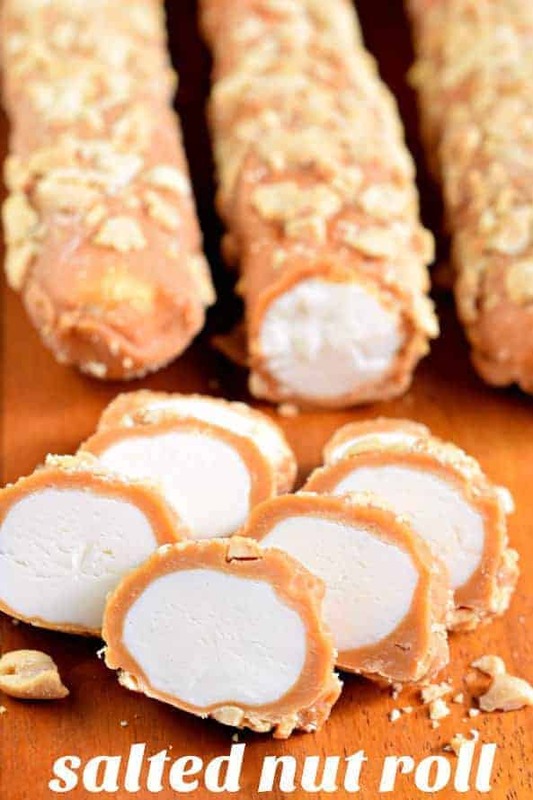 To cover the marshmallow centers, unwrap the frozen log and using your hands, take one section of caramel and spread it over the center completely. It will feel like you’re working with playdoh. Once the entire log is covered, press the chopped peanuts into the caramel. Re-wrap in parchment paper and refrigerate. Repeat for each log. When ready to enjoy, slice each log into 1-inch pieces. Aimee, I was so curious how you made the center of this roll–genius! I would love to get this as a gift! what a great candy to gift this holiday season! Let me just say DOUBLE WOWZA! This looks incredible! Where does the ‘Salted’ come in? Is it ‘salted peanuts’? 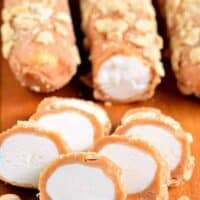 Where to get the caramel bits? This is a fabulous looking candy! Love the marshmallow frosting inside the caramel and nuts! Perfect candy to give as gifts this holiday season! I made it for my family this weekend, and everybody loved it. The rolls were so delicious! I will make more of them for the holiday season. once it is all done and you have cut and stored it in an airtight container does it need to continue to be refrigerated ? I would like to add these to the goodies that will be mailed out to family ! I kept them chilled so they last longer and didn’t get too soft! These look amazing! I used to work at a Cracker Barrel and the nut rolls were my absolute fave. Excited to have a way to make them at home — although I’ll have to plan on making a lot of them gifts because they’re too delish. Thanks, Aimee! Yumm!! This looks so good. Ummm, I have never claimed these are keto friendly?!? !